If you’re like us and you love import autos for their superior design and simply tasty level of speed and precision, then you’ve probably been itching to get your hands on one of these autos for what feels like an eternity. When you finally get your hands on your very own Mini Cooper or BMW you aren’t thinking about the auto maintenance down the line, you’re thinking of how great it’s going to be to drive it to work every day. You might even be thinking of how great grocery shopping is going to be just because you get to drive your import auto to the store. Don’t let the inevitable auto maintenance you’ll need down the road spoil the experience right now. Together, we’ll find a schedule that will keep the common Mini Cooper maintenance issues perfectly inline. In our previous Mini Cooper article, we discussed various issues with the transmission and clutch, in this article, we’ll expand on what other issues might occur and how you can go about increasing the longevity of your vehicle. 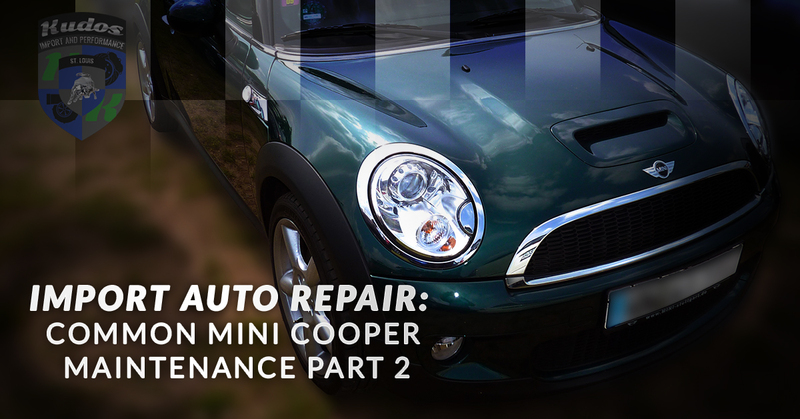 For most Mini Coopers, you might experience a slight rattle in the timing chain. In general, you’ll hear it when the car is idling or when you attempt a pretty cold start. People have been known to call it “the death rattle” but that seems a bit hyperbolic to us. If you hear the noise, bring it into your Chesterfield Kudos Luxury Import, as it shouldn’t be left uncared for. It might be a pricey repair, but it’s not nearly as pricey as the transmission replacement and regular oil changes, or changes every 5000 miles should prevent this issue from ever occurring. Mini Coopers, as you probably already know, is produced by BMW so it’s no surprise that it shares some similar issues. While the BMW has issues with their variable valve timing, the Mini experiences similar issues with the Vanos system. As with many issues in your car, if the oil isn’t changed regularly things are bound to crop up. When the oil isn’t changed often enough you’ll start to see sludge building up and block the passages. Generally, as soon as you change the oil the car starts to sound way better. It’s not uncommon for the various generations of Mini to see water pump failures on the regular. This generally occurs around 50,000 miles, but won’t happen if you’ve been good with preventative maintenance. As far as the thermostat, all of them on Mini Coopers no matter the generation will fail because they’re made of entirely plastic. In fact, it’s probably easier to replace these before you even find a leak merely to prevent the inconvenience and cost of handling a leaky thermostat. As a general rule, anything made out of plastic won’t last very long, except for when it reaches the landfill. Thus, since the front radiator support in all Mini Coopers is made of plastic, you’re going to be looking at replacing it sooner, rather than later. This piece is responsible for holding the radiator as well as the cooling fan and condenser assembly. It sits pretty low and is located under the front of the vehicle and can be damaged with some less than conscious driving. Parking your Mini with more care can go a long way to preserve the longevity of the plastic pieces sitting too close to the ground. If you’re concerned about some of your Mini’s common import auto needs, reach out to us. We’d be happy to calm your nerves or let you know what we think the problem is. If there’s an issue, we can set up an appointment to ensure that your Mini Cooper runs like it’s good as new for as long as possible. We’re passionate about ensuring that you drive what makes you feel good, like your import auto.